Peru has many wonderful cities and towns that a visitor can explore. However, Cusco is one of the cities that absolutely cannot be missed. Not only is it a great jumping off point to the Sacred Valley and the many Incan sites that surround the area, but it is a highly picturesque city with many sites to see and explore. I first arrived in Cusco after spending a few days in Lima. 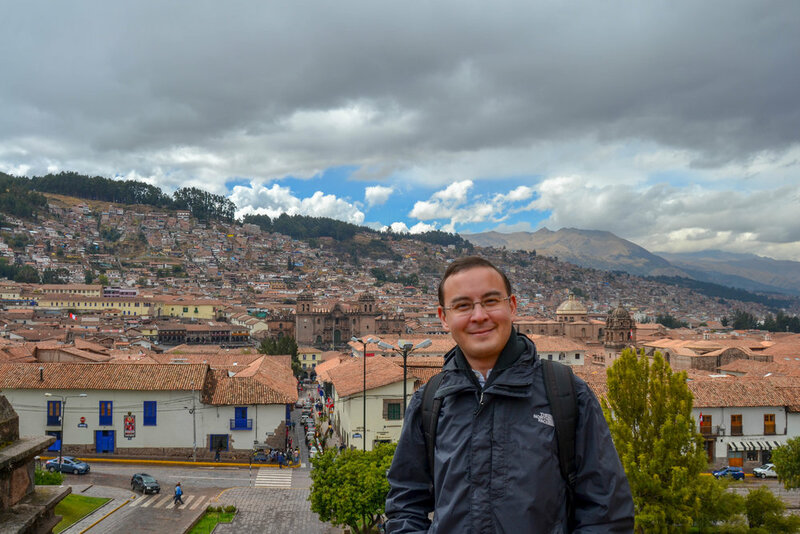 I would definitely recommend spending two or three days just exploring the city of Cusco. It has a lot to see, and one can easily find a lot of things to see and do. Since I love history and art, I’m always on the hunt for any and all historical sites. For the history buff, Cusco has a ton of historical sites to explore. In my opinion, one of the best things to see is the Archbishop’s Route (Circuito Religioso Arzobispal). This is essentially a combined ticket that provides entrance into the Cathedral of Cusco along with two adjoining buildings (Templo del Triunfo and Templo de la Sagrada Familia), the Church of Saint Blase, the Church of Saint Christopher, and the Archepiscopal Museum of Religious Art. The Combined Ticket to these 5 sites costs 30 soles (approximately $9 as of 2018). In addition, a map is on the back which shows where all the places are located in relation to the Cathedral and Plaza de Armas. The ticket itself is very easy to use. All you do is arrive at the location, show the ticket, and the attendant at the site will cross out the location. Another good thing about this ticket is it is valid for 30 days, so you don’t have to see everything in one day. In my case, because I was on a relatively tight schedule (as always), I did the entire thing in one day, but it can certainly be split up into a couple different days if you choose. Depending on your pace, this can take up a morning or even a day. However, while the Circuito Religioso Arzobispal is definitely worth doing, there are a lot of fascinating other sites and museums to visit within the city. 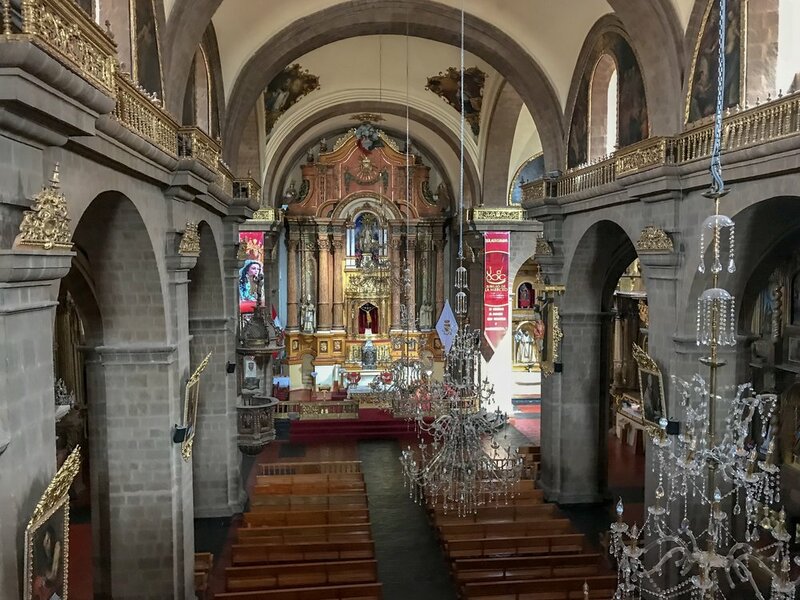 Since I only spent a couple full days in the city, I did not get to see everything that Cusco has to offer, so this list does not include everything to see. However, I think the attractions on this list are definitely worth seeing for any first-time visitor to the city. I have added a note on the places that are included in the price of the Combined Ticket for the Circuito Religioso Arzobispal. In those cases, you just need to present your ticket to the person at the ticket desk, and you’re good to go! The Monastery of Saint Catherine of Siena is a fascinating museum that shows how the nuns lived and worked during the 17th century. A visitor can see some different artifacts and several of the rooms which the nuns lived in. I personally found the dormitory to be quite interesting since the rooms (cubicles) were very basic and afforded little privacy (only a curtain). This is a good activity to do if you just want to spend the day exploring the city and are taking a break from some of the more strenuous types of hiking. 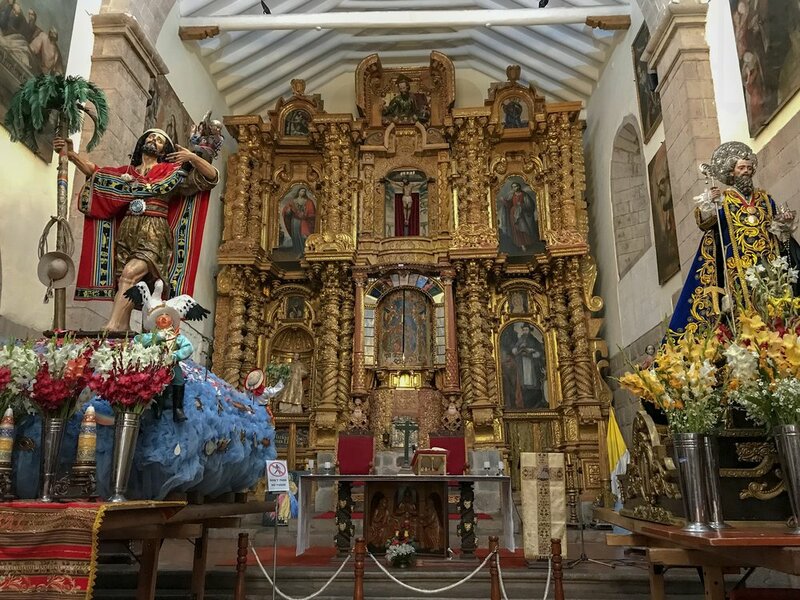 The Church of the Society of Jesus is a Jesuit church located right by the Cathedral of Cusco in Plaza de Armas, so it is impossible to miss. The church’s main altarpiece is a true work of art. It is also possible for visitors to go up into the belltowers which presents a beautiful view of the Plaza with the Cathedral of Cusco. For visitors who are interested, it is possible to hire one of the guides in the church to take you around and point out some noteworthy items. However, it is not required to have a guide, and you are welcome to walk around on your own in the church. The Cathedral of Cusco is a must-see attraction in Cusco and is impossible to miss. The Cathedral is located in Plaza de Armas. 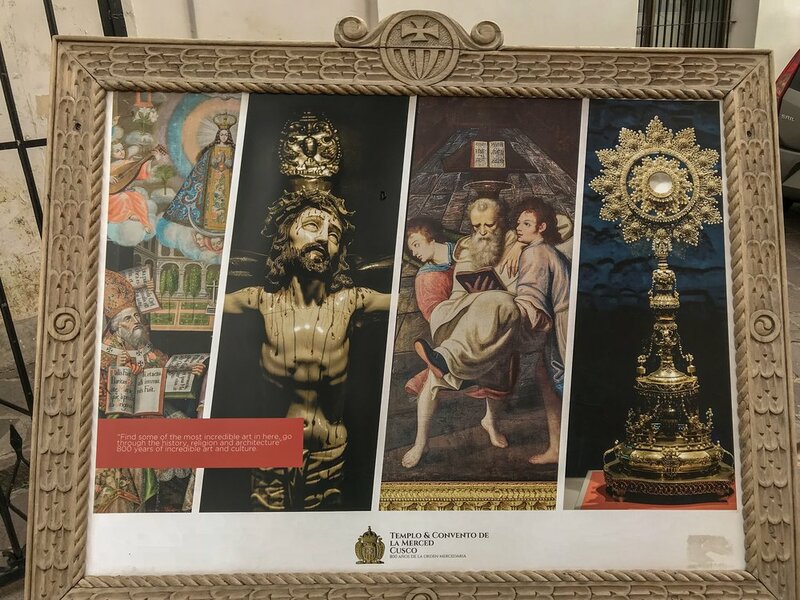 While there is a fee to enter the Cathedral and the adjoining buildings (Templo del Triunfo and Templo de la Sagrada Familia), it is possible to purchase a combined ticket for the Archbishop’s Route. For a price of 30 soles, it is possible to gain entrance to the Cathedral along with several other religious sites in Cusco. Unfortunately, pictures are not permitted inside the Cathedral, but if you are sly, you might be able to sneak a few. Even though the main doors are often closed, I did notice that early in the morning on Sunday that they were open. Those that wanted to come in and pray were welcome to. 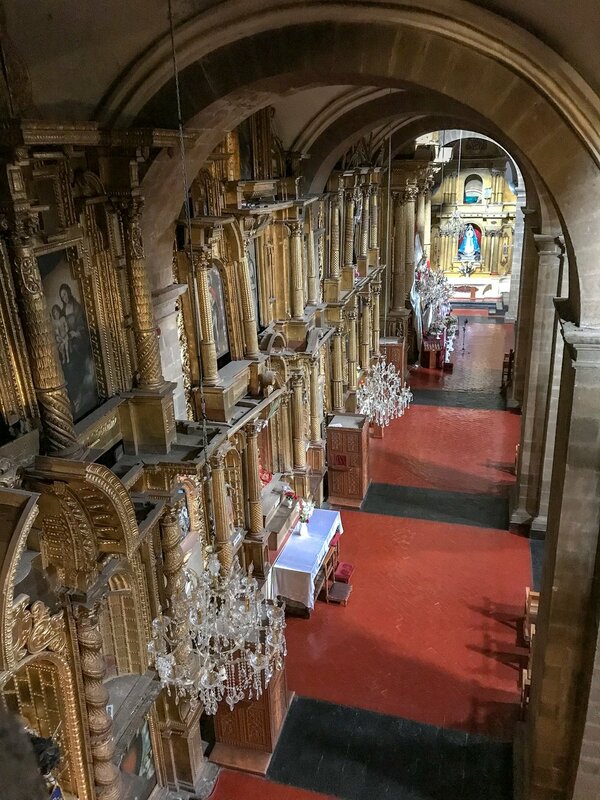 The Church of Saint Blase is a relatively unassuming and small church from the mid 1500s located a couple blocks northeast from the Cathedral and Plaza de Armas. Depending on your walking speed, you can reach the church in about 5-10 minutes from the Cathedral of Cusco. While from the outside, the church is rather unimpressive looking, it holds a magnificently carved altarpiece that should not be missed. In addition, it is also possible to climb the belltower and get a view of the small plaza the church is located in along with a view of the city. The Church of Saint Christopher is the furthest from the Cathedral of Cusco, but it also provides the most amazing views of Cusco since it sits on top of a hill that gives a marvelous view of the city, especially Plaza de Armas on a clear day. Despite the rain that happened on the day I went, there was a break in the clouds to bless me with some great photo ops. While it should not take too long to head here from the Church of Saint Blase, it took me longer than it usually would since I encountered heavy rain without an umbrella. As a result, I often had to wait under a covered porch for the rain to stop. In addition, even though I followed the map on the back of the Combined Ticket, I still managed to get lost (typical) and ended up taking a long way instead of just keeping on the path which led to the church just up the hill. The Convent and Church of the Merced is a fascinating museum that is located very close to Plaza de Armas. It has a plethora of religious items that date from the colonial period. In addition, there is a beautiful central cloister that a visitor can walk around, relax, reflect, and take pictures in. I actually came upon this place by accident. Each time I had passed the church, the main doors were always closed. However, on the day I went, the gate off to the side was open with the door to the museum open. Even though I had something else on the agenda, I did not want to take a chance that the place would be closed when I would come back, so I went in. I am glad that I visited when I did since when I returned to the area a couple hours later, the gate was closed. The Archepiscopal Museum of Religious Art is actually located between the Cathedral of Cusco and the Church of Saint Blase. The museum itself is rather small but fascinating and not particularly busy despite being in a heavy tourist traffic area. The collection features a lot of religious works from the Cusco School of Painting that dates from the 16th and 17th centuries. This can be a great place to spend some time to escape from a rain shower. The Convent of Santo Domingo is located slightly away from the other attractions but still a super easy walk from Plaza de Armas. The complex is quite large and can be a bit crowded with tourist groups since the convent sits on Incan ruins. 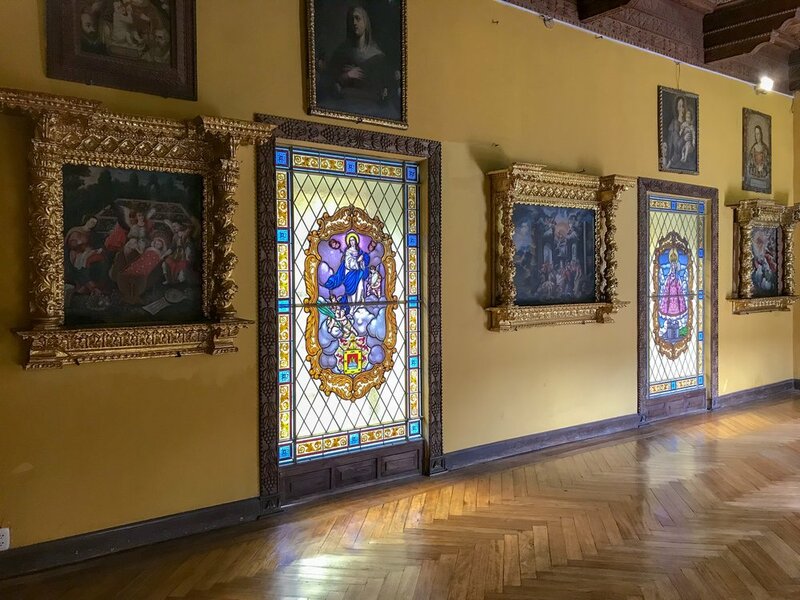 It is possible to see a lot of colonial art and walk around the 2nd level of the central cloister. The Convent of Saint Francis dates from the 16th century and has a beautiful central cloister, artwork, and catacombs. However, it is only possible to enter with a guide who works at the church. Since there is a guide, it is not really possible to take pictures except in the central cloister and the roof which the guide will take you up to. The Pisco Museum is not really a museum per se. Instead, it is a bar/restaurant that will provide tastings of pisco, which is a major product of Peru. When I went inside, a bartender brought up four bottles of pisco and explained how they are different, and then he let me taste each of the bottles. For me personally, I found the pisco to be a little bit strong for my liking, but after the tasting was over, I had a pisco cocktail that was actually pretty good. However, I will admit that afterward, I did feel quite tired and was pretty much done for the rest of the day. Thankfully it was near the end of the day, so I did not feel too bad about that. 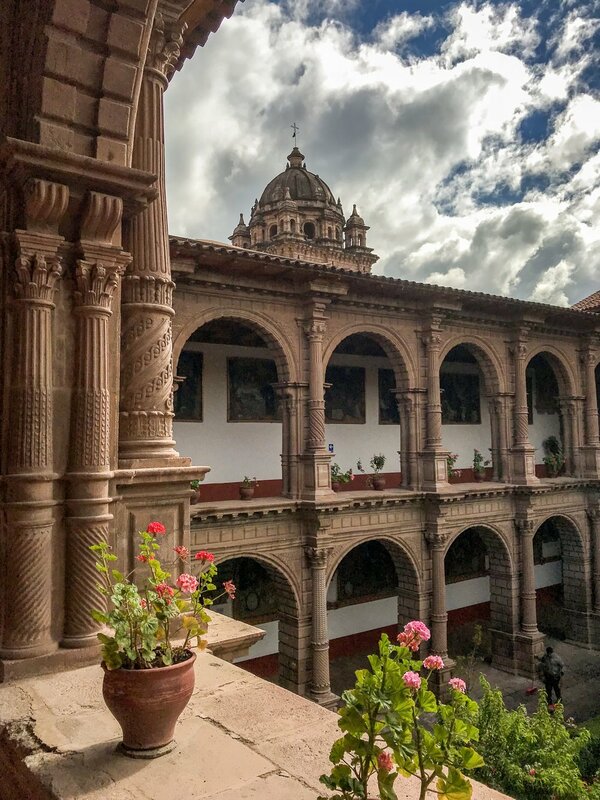 While there are many more museums to see in Cusco, I think these are 10 must-see attractions that any visitor should visit when they are in the area. Seeing all of them could easily take a few days. Which ones have you seen? What are some other places a visitor to Cusco should see? I’d love to hear your feedback! Of course, while in Cusco, be sure to spend some time taking it easy and taking in the environment and atmosphere of the city. Sometimes you’ll be surprised at what you’ll see. 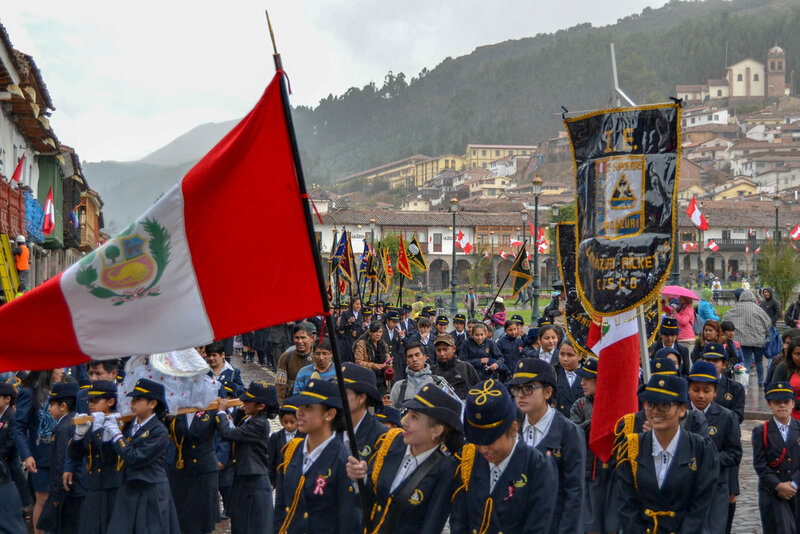 Like in Lima, I came upon a religious procession of schoolgirls who were carrying a statue of the Virgin Mary along with many different flags. It was a different experience and a nice break from rushing around to try and see everything.